A high index of suspicion is required to recognize compartment syndrome in both closed and open fractures. Compartment syndrome of the foot is well described with cases secondary to closed trauma. We present an unusual case of an open Lisfranc fracture with compartment syndrome. Diagnostic modalities are discussed and early diagnosis appears to improve the success of treatment. Key words: Compartment Syndrome, Lisfranc joint, open fracture, closed fracture. Compartment syndrome is considered a surgical emergency. When not treated in a timely manner, compartment syndrome can lead to disastrous complications including muscle necrosis, Volkmann’s contracture, neurological deficit, crush syndrome, and even death. There are reported cases of associated compartment syndrome in open fractures of the lower leg, however not in the foot. As classically described, compartment syndrome results from increased interstitial pressure in a closed osseofascial compartment, which leads to micro vascular compromise. Typically, interstitial pressures in a closed osseofascial compartment are less than intravenous pressures. A 48 year-old male was brought to the Emergency Department (ED) after a motor vehicle collision (MVC). After thorough evaluation by the trauma team, the patient was found to have suffered multiple rib fractures, a left knee laceration, and a left open Lisfranc fracture. The patient was admitted for a 23 hour observation and Foot and Ankle Surgery (FAS) was consulted for the management of the open Lisfranc fracture. The FAS evaluated the patient two hours after arriving to the ED. The patient’s past medical history was significant for diabetes mellitus, hypertension, and depression. He denied prior surgeries and known drug allergies. His current medications included metformin, lisinopril, and ZoloftTM or sertraline). The patient related to occasional alcohol consumption and occasional chewing of tobacco. During the evaluation process by FAS, the patient complained of severe pain in the left foot. The patient reported unchanged pain level even after multiple doses of analgesics in the ED. He was administered 4 mg of DilaudidTM or hydromorphone hydrochloride and 2 mg of morphine over a two hour period before he was evaluated by FAS. Pain was elicited with palpation of the dorsal aspect of the left foot and with passive range of motion of the metatarsophalangeal joints. The dorsal aspect of the foot was tense upon palpation. Both dorsalis pedis and posterior tibial arteries were palpable. There was a 2.5 cm to 3 cm longitudinal laceration over the third inter-metatarsal space of the patient’s left foot consistent with a grade II open injury.8 There was an associated +2 edema to the dorsal aspect of the left foot. The 3rd, 4th, and 5th digits of the patient’s left foot appeared dusky however capillary refill time was less than three seconds to all of the digits. 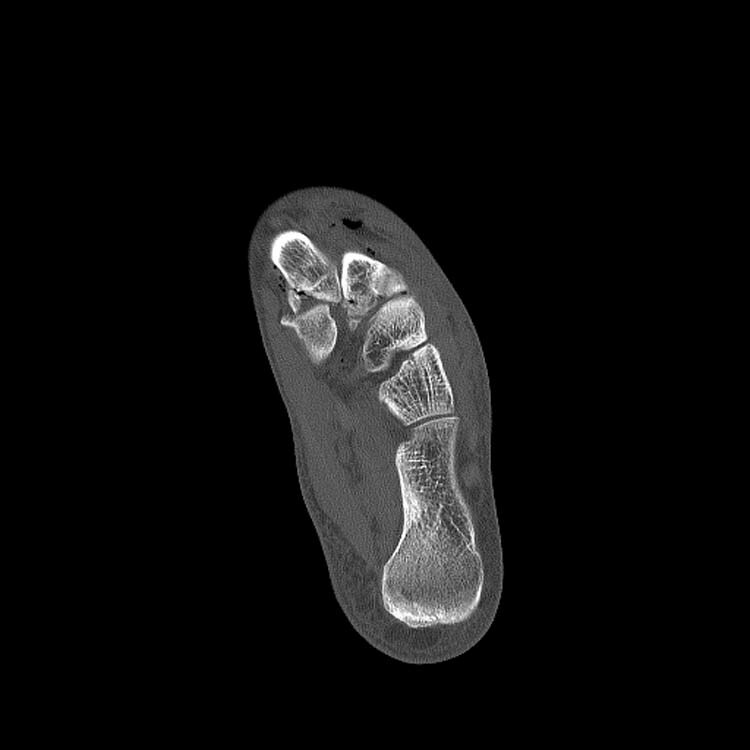 Radiographic examination revealed a first metatarsal base fracture with mild widening of the first tarsometatarsal joint. Computer Tomography (CT) revealed comminuted fractures of the proximal first and second metatarsals with intra-articular extension. The first and second metatarsal bases were displaced laterally. Figure 1 lateral view showing subcutaneous air dorsally. 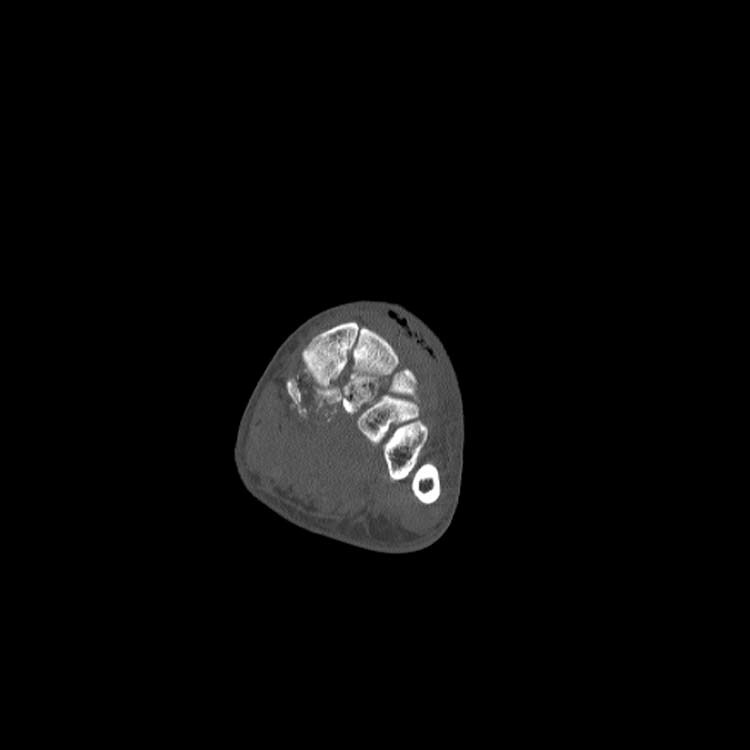 Figure 2 Axial view shows the Lisfranc injury with subcutaneous and intramuscular air bubbles. 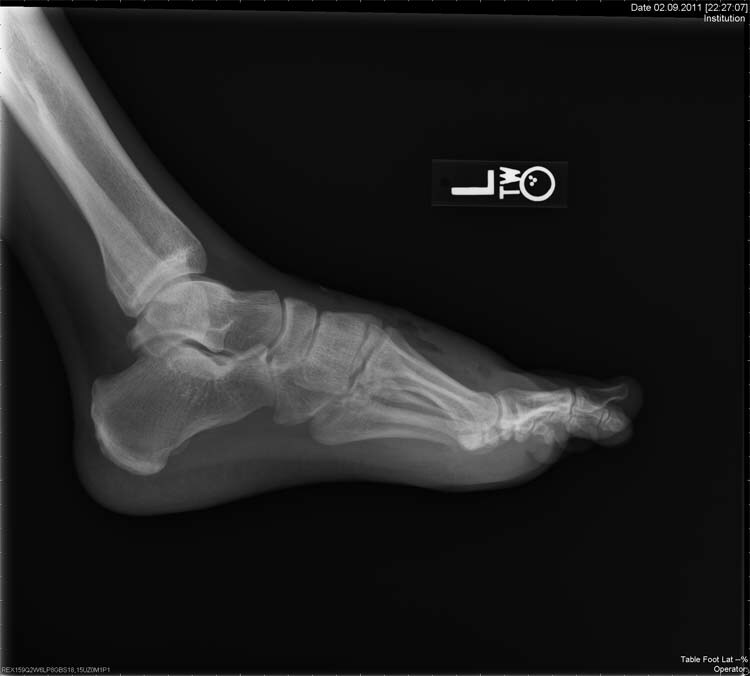 Figure 3 Frontal view also shows the Lisfranc injury with subcutaneous air. The patient was taken to the operating room for decompression fasciotomy of the left foot. The laceration on the dorsal aspect of the patient’s foot was extended proximally and distally. Upon decompression of the interosseous compartment, there was approximately forty to fifty cubic centimeters of hematoma released from the wound. After evacuating this hematoma, the dorsal aspect of the left foot was soft upon palpation and there was hyperemic response to digits 3-5. The remaining compartments were soft and were not released. The wound was then subsequently irrigated with 6 liters of normal saline. A negative pressure therapy device was then applied to the patient’s left foot (Wound Vac KCI™, San Antonio). Figure 4 Left foot with dorsal wound and percutaneous Kirschner wires. There are multiple modalities available to objectively diagnose compartment syndrome such as intracompartment pressure monitoring (ICP), near infrared spectroscopy (NIRS), magnetic resonance imaging (MRI), scintigraphy, and laser Doppler flowmetry. There are several sources of error and learning curves associated with each of those modalities. It is recommended that compartment syndrome be confirmed by measuring the intra-compartment pressure. In our patient we did not feel the need to measure the intra-compartment pressure, as clinical signs for compartment syndrome were present. Our patient had pain that remain unchanged since arriving to the ED despite the administration of multiple doses of analgesics. The dorsal aspect of the foot was tense, pain was elicited with passive range of motion, and there was pallor of the digits 3-5. All reliable clinical findings for compartment syndrome. In order to prevent disabling complications, early diagnosis derived from clinical findings is the key in the successful treatment of compartment syndrome. 1. Elliott K, Johnstone AJ. Diagnosing acute compartment syndrome. JBJS 2003 85B: 625-632. 2. Blick SS, Brumback RJ, Poka A, Burgess AR, Ebraheim NA. Compartment syndrome in open tibial fractures. JBJS 1996 68A: 1348-1353. 3. Mubarak SJ, Owen CA, Hargens AR, Garetto LP, Akeson WH. Acute compartment syndromes: diagnosis and treatment with the aid of the wick catheter. JBJS 1978 60A:1091-1095. 4. Matsen III, FA. Compartmental syndrome. A unified concept. Clin Orthop 1975 113:8-1114. 5. Manoli II A, Weber TG. Fasciotomy of the foot: an anatomical study with special reference to release of the calcaneal compartment. Foot Ankle 1990 10: 267-275. 6. Myerson M. Diagnosis and treatment of compartment syndrome of the foot. Orthopedics 1990 13: 711-717. 7. Myerson MS. Experimental decompression of the fascial compartments of the foot – the basis for fasciotomy in acute compartment syndromes. Foot Ankle 1988 8: 308-314. 8. Gustilo RB, Anderson JT. Prevention of infection in the treatment of one thousand and twenty-five open fractures of long bones. JBJS 1976 58A: 453-458. 9. Rorabeck CH, Macnab I. Anterior tibial compartment syndrome complicating fractures of the shaft of the tibia. JBJS 1976 58A: 549-550. 1 Associate Professor, University of North Texas Health Science Center. John Peter Smith Hospital, Department of Orthopedics, Podiatry Division, 1500 South Main Street, Ft. Worth, TX 76104. 2 PGY-2, John Peter Smith Hospital, Department of Orthopedics, Podiatry Division, 1500 South Main Street, Ft. Worth, TX 76104. This entry was posted in Uncategorized and tagged Closed fracture, compartment syndrome, Lisfranc joint, Open fracture, Uncategorized. Bookmark the permalink.